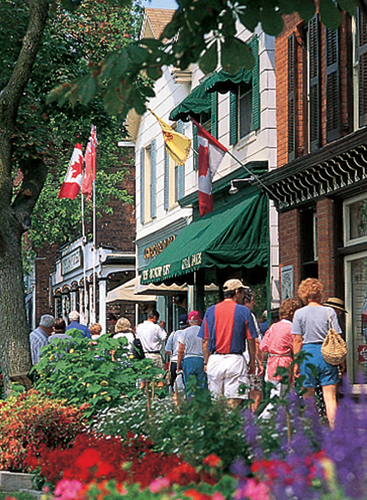 Within easy driving distance of Toronto are many delightful communities worthy of a daytrip or a more extended visit. North of the city, Honey Harbour and Gravenhurst are the gateways to cottage country, with beautiful lakes and forests, while Collingwood offers excellent skiing in winter and summer fun on Georgian Bay. To the west of Toronto are many charming small towns, such as Stratford, with its world-renowned Shakespearean theater festival, and the Mennonite community of St. Jacobs. Further west, along the shores of Lake Huron, wide sandy beaches stretching north and south of the lovely town of Goderich beckon. The Niagara Peninsula, south and east, can easily fill a weekend, with attractions such as Niagara Falls and Ontario’s best wine country, charming inns, and award-winning restaurants. St. Jacobs is the heart of Ontario’s Old Order Mennonite community. Horse-drawn buggies carrying farmers in dark suits and wide-brimmed black hats, the women in aprons and bonnets, share the road with motor vehicles, and illustrate the way of life of this Anabaptist sect. Shunning modern technology, electricity, and the military, they began settling here in 1799, after immigrating to the US from Europe, where they were persecuted for their beliefs. While the town itself sends kitsch to new heights, the falls are spectacular – truly a natural wonder and well worth the trip . This charming historic town looks much as it did when built in the early to mid-1800s. Beautiful Georgian and Neo-Classical homes and quaint shops reward leisurely exploration. 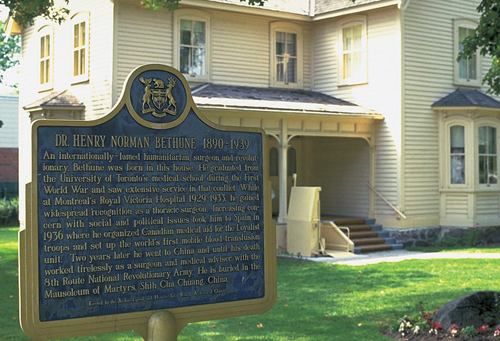 History buffs won’t want to miss the Niagara Historical Museum, with exhibits on the region’s fascinating past. 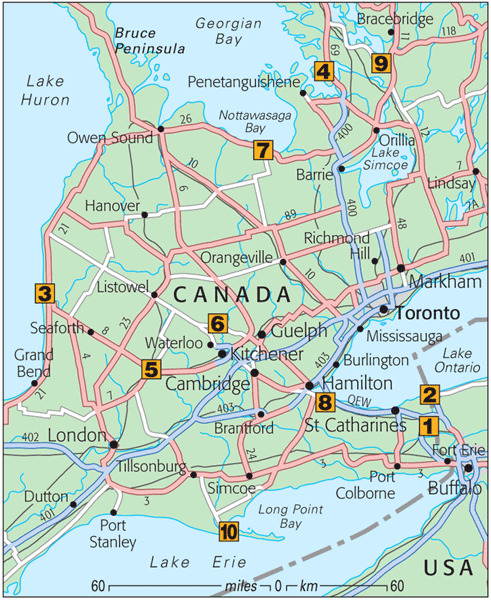 The town is a good base for excursions along the scenic Niagara Parkway and to excellent wineries. 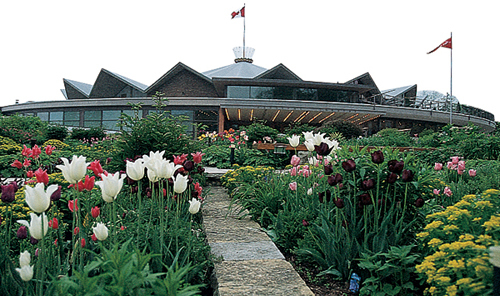 In summer, it is home to the Shaw Festival. Founded in 1827, this town on the shores of Lake Huron has a rich marine history and fine Victorian architecture. Its downtown streets radiate from an unusual octagonal “square,” at the center of which is the town hall (1890). The Huron County Museum has a superb collection of old farm equipment and military artifacts. Other stops of interest include the Huron Historic Gaol, a jail built 1839–42; an 1847 lighthouse; and a marine museum in an old lake freighter, open seasonally. Georgian Bay’s rugged landscape is characterized by the windswept rock and pine trees of the Canadian Shield. Thousands of islands – some just mounds of granite – dot the Bay; 59 of them make up the park. Access to the largest island, Beausoleil, with its hiking trails, sandy beaches, forest, and the largest variety of reptiles and amphibians of any national park in Canada, is via a 40-minute water taxi ride from the town of Honey Harbour. Known worldwide for its Shakespeare festival, the city continues the theme of the bard with, among other things, a garden planted with every species named in his plays. Riverside parks are picnic-perfect; shops sell works by local artisans. Check out local history at Stratford-Perth Museum, and a fine example of High Victorian architecture – Perth County Court House (1887). Arts and crafts, antiques, and gift shops set in 19th-century buildings; bakeries; and cozy restaurants abound in these historic villages. 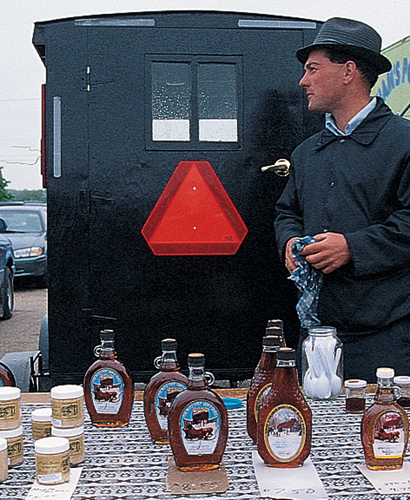 St. Jacobs’ two markets have hundreds of flea-market and produce stalls – including those offering the area’s specialty, maple syrup, sold by local Mennonites. For more on this sweet treat, visit the Maple Syrup Museum at 1441 King St N, St. Jacobs. A 15-mile (24-km) drive northeast is Elora, on the bank of the Grand River and stunning Elora Gorge. This city takes full advantage of Niagara Escarpment scenery. Nearby Blue Mountain, a high point of the escarpment before it dips to lake level at Collingwood, is Ontario’s best ski hill. At Scenic Caves Nature Adventures, walk Ontario’s longest suspension footbridge, set high in the treetops, or explore the limestone and ice caves. 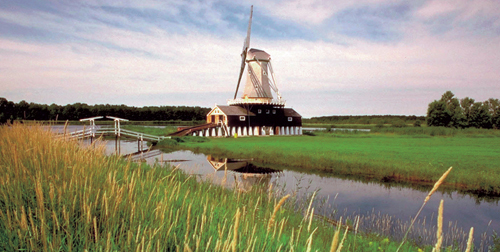 Four nature sanctuaries are replete with greenhouses, cultivated gardens, and trails. In spring, the world’s largest lilac collection bursts into bloom. Centuries-old roses thrive summer to fall. In winter, visitors get their fix at the indoor Mediterranean Garden. Gift shop, café, and teahouses (seasonal). The city of Gravenhurst is a good base from which to explore the Muskoka region. It is also the point of departure for lake cruises aboard an 1887 steamship – the oldest operating steamship in North America. Stretching from Algonquin Park to Georgian Bay, Muskoka has over 1,600 lakes and rivers and is a fantastic summer destination. Hundreds of beaches offer excellent swimming opportunities; boats can be rented at launches throughout the region; outfitters organize canoe trips to secluded areas. This world-renowned refuge for migrating birds, especially waterfowl, has been recognized by the United Nations as a biosphere reserve. Formed over thousands of years by sand washed from Lake Erie’s shoreline, the 25-mile (40-km) sand spit has white sand beaches; the lake’s shallow depth ensures warm water throughout the swimming season. Spring and fall are excellent for bird-watching; miles of trails through dunes, forests, wetlands, and grasslands can be enjoyed year-round. Campsites are equipped with showers, laundry facilities, and electrical hook-up.